Available in the XL and Mega versions, the new eGo ONE CT is easy to operate and puts a temp control into everyone's hands. Detailed review of this novel Joyetech mod. Joyetech revisits its excellent vaporizer eGo One in a temperature control version accessible to all. In January 2015, I ranked 4/5 Joyetech’s first version of the eGo One as it was, according to my experience, one of the best kits to quit smoking. And I was probably right considering the many satisfied vapers that I could meet using this model. Joyetech has updated one of its best-sell by providing control on temperature without any prior adjustment except right choice of resistor. Let’s pay a little bit of attention to this easy operation device! Joyetech always offers global solutions so that consumers have an easy choice for a complete integration of all the elements making a serene vape, in safety and above all with ease. This desire is confirmed here since this is my first time vaping on an e-cigarette offering a real control on temperature that doesn’t require any prior standardization. It is a good idea on paper! Let me present you the latest Joyetech, the eGo One CT. The set is still available in two different size formats, one small and one XL, here in test. You will also notice a Mega (22 mm) version that will be added to the previous formats in 19 mm. The first version brought us the Sub Ohm and this new version the temperature control. Here again, no manual adjustment is required. Simplicity. In my initial review of the eGo One, I bluntly criticized the potentially high temperature that could reach the first version with a 0.5 Ohm resistor. 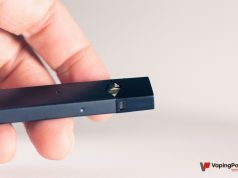 Logically, I would think that a temperature control is actually an added value for health and also for safety, provided that the exceptional vaping quality is still present with this new CT version. This eGo CT keeps offering a standard vaping mode with at variable wattage and a conventional resistor of 1 ohm. The ego One CT keeps 100% of the design and ergonomics of the former version, well-made ​​and intelligently thought as an autonomous global solution. 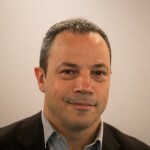 To increase the autonomy you will need to buy a second kit or a second battery but this ego One remains near perfect when considered the weight or the balance. It also appears that the Fire is the same and therefore it will surely be as fragile as in the earlier versions. Take care! For beginners, this eGo One CT comes with a battery, a clearomizer, a resistor and a charger for about 50/60 Euros. It gathers at this price all you need to vape. It is specifically designed for vapers who want something light, downsized and simple, without the need to worry about options. A must-buy to quit smoking! 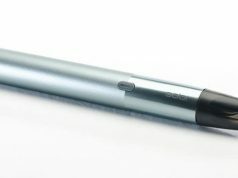 Joyetech continues to fuss you over with the new eGo One CT, as it used to do with the eVic VT and VTC. Joyetech’s box is almost perfect! The packaging exudes quality and when one opens the box and details its content, everything is there to start vaping without worrying. It is always a beautiful performance from Joyetech to smoothen features to offer a completely flush vaporizer, a sobriety that I love and of perfect ergonomics. The only difference with conventional versions will be the blue rim seal for Nickel resistors or the red one for Titanium to identify which mode to choose before you start vaping. The box content is compete and more than adequate for this price. In fact, you will find a good quality charger, USB cable, 2 spare resistors and a user manual. The two resistors are used with the temp control modes and a classical one for the wattage control mode. These resistors are exactly the same as for other kits EVIC VT and VTC mini, which can also be a good argument since you can purchase eGo One in complement to a VTC Mini, for example. 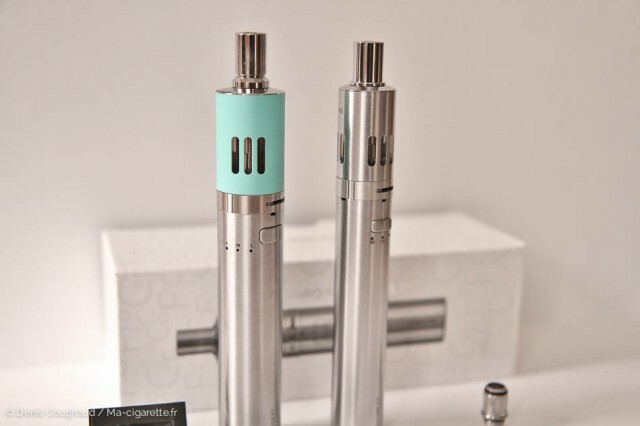 As usual, with Joyetech, the assembly of the kit is straightforward, all appears as a sort of a mini Mod that one can easily hide in the palm of a hand. The threads are of good quality, the air flow adjustment ring works great without any effort and has a nice little peg to lock it, if necessary. The only fear will be with the Fire that happened to block sometimes, making the battery unusable. The second noticeable difference will be the presence of three small LEDs under the Fire that indicate which mode is set up and Joyetech had the excellent idea to match the color of these LEDs with that of the rims: Red for titanium and blue for Nickel. This is a good tip for beginners but unfortunately not mentioned in the manual. Another great idea from the manufacturer is to offer mode selection when battery is off by a long press on the Fire. This prevents from burning the resistor by a poor choice of the mode. It remains that if you are not careful and you vape in NI or TI mode on a conventional resistor, you will certainly burn it right away! This LED will also tell you the status of your battery by its flashing pulse. This battery will then select the power to be sent in mode “W” or the temperature in mode “Ti” or “Ni”. In watts, it will feed 25W from 0.4 to 0.8 Ohms , 15W from 0.8 to 1.6 Ohm and 7.5 W above 1.6 Ohm. With respect to temperature, it will heat at 245°C for Ni and 250°C for Ti that are ​​too low, in my opinion, to offer the best vaping quality but also have the merit of protecting the vaper and his device. For scatterbrained users or those who never read the manual, the battery will directly switch to the W mode if the resistor is above 1 ohm. This is definitely a success in terms of design, ergonomics and simplicity of use with regard to temp control. It would have been perfect if Joyetech had proposed a choice of vaping intensity, as with the Mega VT 22 mm. We shall see that later. After 5 Press on the Fire button, a micro LED lights up just below, that is fine, classy and not too clumsy! This micro LED lights up when you vape and also displays the power level in the battery. The color varies depending on the selected mode. In contrast, for mode selection you need, battery off, to press and select the W-Ti-Ni mode that is………… hidden by your thumb! Indeed, if you want to see the LEDs you will have to press the Fire from the top. Amazingly missed from Joyetech and even more regrettable that the solution was found in the Mega where these LEDs have been shifted to the sides. In the power mode (W), the 1 Ohm resistor is sufficient to produce a plentiful steam, not too dense. However, I was disappointed by the low temperature preset values for my taste, creating a gap between the temp and power modes. The first two or three puffs are delightful but beyond the temp control switches on and keeps activated. The result is a bland and sparse vape. With identical resistors, the VTC Mini is rather around 275/285°C for Ni, 20-30°C higher than than the eGo One. The only way I’ve found to cancel the preset is to unscrew and screw again the Clearomizer on the battery, in this case then you get back to a tastier and more abundant steam… weird! These low presets come as a (bad) surprise from Joyetech especially when using Mega compared the 22 mm. On this version to which I set up the tiphany blue clearomiseur of my VTC Mini, I could choose between the three power modes: low, medium and high. Unknowingly, I found myself vaping all the time in the higher mode, 315°C, which is the only vaping mode that worth its name. I would also like to mention that the three modes are poorly chosen because a big gap exists between the 250°C (medium) and 315°C (high), while the 220°C ​​is of no use at all! The average battery life of my XL/19mm test version made ​​no miracle with its 2200 mAh but still held an honorable period of 6-7 hrs in conventional use and Ni mode. It does not hold out the whole day, for sure, but it’s still honest with respect to the weight and size of the device. In power (W) mode, these Ti and Ni resistors have never given me a burnt taste and offer a plentiful and tasty steam provided that power is adequately adjusted. In contrast, the temp control mode didn’t thrill me at all all since the 19 mm version does not allow any adjustment. I quickly returned to my standard resistance and W mode. That’ too bad because the ideal solution is in the 22 mm! These resistors have always gave me ​​a more tasteless feedback than the other brands. The filling is tricky all the time because the space between the large central tube and the edge of the tank is narrow on the 19 mm version. Be also careful during this procedure and make sure that the resistor is always firmly tightened; I noticed that unscrewing the tank also loosens the resistor, which causes a great leak, sometimes. Apart from this point, I never had to complain of any leak. The air control is achieved via a small rim at the bottom of the clearomizer, identical to the previous version but still providing a noisy vape on the long term. Unscrewing the rim will make an aerial vape for those who wish or an old-style hit when clamped. My final conclusions of this test are that if you are looking for a control on the temperature, a good vape quality and the design of this eGo One, do prefer the Mega 22 mm version that offers a power control even in the temp control mode, which is not the case for the classical 19 mm. For now, the 19 mm CT version is perfect in the Wattage mode but the preset of temperature in the temp control mode is not yet achieved. At present, I do prefer an eGo One VT (22 mm) than the eGo One CT (19 mm)! I give a 2/5 to the CT version for the temp control mode and a 4/5 for its the wattage mode. And I give a 4/5 to the VT Mega 22 mm all modes which is, to me, the best deal. The eGo One CT 19 mm is, in my opinion, not the best choice if you really want to vape with a temp control mode: whether with the Titanium or the Nickel resistors, the maximum temperature preset is too low and reached too quickly. If this temp control is not your requirement, do prefer the classical version that is always a great choice. Now, I strongly advise you to choose the VT 22 mm version that offers temp control features in simple setting through 3 modes that can be accessed by three successive clicks. Rating of de 2/5 for the CT version in temperature control mode and 4/5 in wattage variable mode and VT Mega version (22 mm) in all modes. Reviewer for the past 3 years, I've tried most of the popular products available on the market. My conclusion about the best vaporizer ? The one that simply fits your need and makes you forget tobacco.